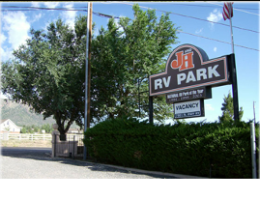 Welcome to J & H RV Park! Flagstaff is a community of about 60,000 people. It is the home of Northern Arizona University and Coconino Community College. Clean industry abounds in Flagstaff with W.L. Gore, New England Business Systems, Ralston Purina, Burlington Northern Santa Fe Railway, and Walgreens Distribution Center. Of course Flagstaff’s prime industry is tourism. 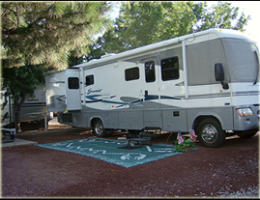 With over 3,500 motel rooms, several campgrounds and rv parks, numerous restaurants, gas stations, and entertainment mixed with the beauty of the highest peak in Arizona, 12,500 feet, Flagstaff has become a central hub for a week-end get-a-way from the heat of Phoenix to a one, two, or three month long stay. Jerome (Arizona Ghost Town): Jerome was built on Cleopatra Hill above a vast deposit of copper. United Verde mining operations began in 1883, followed by the Little Daisy claim. Jerome grew rapidly from tent city to prosperous company town as it followed the swing of the mine’s fortunes. Jerome’s mines closed in 1953 due to the ups and downs of copper prices, labor unrest, depressions and wars. IN 1965 the Douglas Mansion became a State Park, and in 1976 Jerome became a National Historic Landmark. Today, Jerome is very much alive with writers, artists, artisans, musicians, historians, and families. Petrified Forest: Over 13,000 years of human history and culture can be found at Petrified Forest National Park. The park has many stories to tell whether from the Civilian Conservation Corps or from Historic Route 66. Come see what there is to hear! Glen Canyon Dam: On October 15, 1956, the construction of Glen Canyon Dam began. By 1959, the Glen Canyon Bridge was completed and the new town of Page, Arizona was created. Over five million cubic yards of concrete make up the dam and power plant — equal to enough to build a four-lane highway stretching from Phoenix, Arizona to Chicago, Illinois. It took 17 years for Lake Powell to completely fill for the first time. The plant generates more than 1.3 million kilowatts of electricity with each of the 40-ton steel shafts turning at 150 rpm, generating nearly 200,000 horsepower. With all eight generators operating at full output, over 15 million gallons of water will pass through the power plant’s penstocks each minute. The electricity is upgraded on a transformer deck from 13,800 volts to 230,000 and 345,000 volts for transmission to distant markets. Arizona Snowbowl: One of the oldest, continually run ski areas in the US. Located on the majestic San Francisco Peaks, the Arizona Snowbowl lies 14 miles outside of Flagstaff, 2 hours from Phoenix, and 70 miles from the Grand Canyon. Sunset Crater Volcano National Monument: Established by President Herbert Hoover on May 26, 1930, to protect its geologic formations. In 1990 the name was changed to Sunset Crater Volcano National Monument. It occupies 3,040 acres surrounded by Coconino National Forest. Sedona, AZ: Often called “Red Rock Country” Sedona is a four seasons town in Arizona. Whether it’s history, archeology, arts & culture, shopping, sports or spiritual, Sedona has something to offer you, and with a backdrop of some of the most spectacular scenery in the world. Sedona is surrounded by red-rock “mountains” with names like Coffeepot, Cathedral and Thunder Mountain. At the north end of the city is the stunning Oak Creek Canyon, a breathtaking chasm that is wildly wonderful. Montezuma Castle: On December 8, 1906, President Theodore Roosevelt celebrated the passage of the Antiquities Act by declaring four sites of historic and cultural significance as our nation’s first National Monuments. Although very few original artifacts remained in the structure Roosevelt’s decision assured the continued protection of one of the best preserved prehistoric cliff dwellings in North America. Montezuma Castle National Monument quickly became a destination for America’s first car-bound tourists. Early visitors to the monument were allowed access to the structure by climbing a series of ladders up the side of the limestone cliffs. However, due to extensive damage to this valuable cultural landmark, public access of the ruins was discontinued in 1951. Now, approximately 350,000 people a year gaze through the the windows of the past during a visit to Montezuma Castle. Even 600 years after their departure, the legacy of the Sinagua people continues to inspire the imaginations of this and future generations. Walnut Canyon National Monument: Come gaze across the curved canyon walls! Among the remarkable geological cliff formations of the canyon itself, the shapes of the former homes of ancient inhabitants of Walnut Canyon are easily evident. Arizona Historical Society: Established by an Act of the First Territorial Legislature on November 7, 1864, the Arizona Historical Society (AHS) is Arizona’s oldest historical agency. Architects of the Territory’s code of laws realized they were making history and that it was important to preserve a record of their activities. This became the Arizona Historical Society, formed to collect and preserve “all facts relating to the history of this Territory.” Today, AHS serves as the steward of state and regional history, fulfilling its mission to collect, preserve, interpret, and disseminate the history of Arizona, the West, and northern Mexico as it pertains to Arizona.